Chapter 33: The Day of Kan. I have to add a warning: This will be an arcane and difficult chapter, for here I will attempt to trace a 3000-year history of the Mesoamerican ceremonial centers, starting in Guatemala at about 2400 BC. You may want to skip this chapter since it primarily deals with efforts of the Olmecs to trace the past history of important events through the application of the Long Count. And just as the Olmecs managed to validate their findings, which consisted of locations of the setting Sun along the horizon, (and thus represented anniversary dates of events), so can we, by taking a slightly wider view, reconstruct a history of the primacy of leading ceremonial centers over a span of time possibly starting in 2400 BC. This will reveal the use for the collections of giant stone heads and altars in the Veracruz regions, and the "fat boy" sculptures found in Guatemala. This chapter therefore continues the investigation into the Mesoamerican site alignments started in the previous chapter. With the previous chapter my main purpose was to check site alignments to mountains and volcanoes among early Olmec sites and locations in the Valley of Mexico. The data showed conclusively that the change in the inclination of the Earth's axis could be verified from site alignments before and after 685 BC, and revealed anniversary dates for every important event of the remote past. What I will do in the following is to provide a basis for what looks like region-wide concerns about these dates in antiquity which were "determined" by the Olmecs and the people of the Valley of Mexico, with special attention to Monte Alban. Additionally I will attempt to integrate the large sculptures (like the massive heads and altars) into the brief outline of history provided at the end of the previous chapter. Two things stand out, first the notion that new re-creations of Earth fell on the "Day of Kan," and secondly that this happened in a Katun 9-Ahau. Both of these ideas apparently dated from remote antiquity, from the time of the end of the "third creation" in 2349 BC (which I will detail below), and were verified (so to speak) by data of other catastrophic events of the past. After the Long Count was established, whatever wasn't known about the past could be found through retrocalculation. And it looks like that this may certainly have been done for the end of the "second creation" of 3147 BC, which, however, calculated to 3114 BC. The calendar day on which the world had been recreated was calculated to be August 12. Teotihuacan (200 BC to AD 700) celebrated both July 25 in the solar year and August 12. This giant city is the primary example of the August 12 alignment achieved architecturally. The city was built on a rectangular grid, with the main avenue aligned 15.5 degrees east of north. At the center of the main avenue of Teotihuacan (called "the Street of the Dead" by the Aztecs) is the giant Pyramid of the Sun (also appropriately named by the Aztecs). The Sun sets directly opposite the Pyramid of the Sun, that is, at a right angle to the Street of the Dead, on August 12. August 12 is the result of a retrocalculation which assumes that the solar year consisted of 365.24 days, not 360 days, as the Olmecs had known in 747 BC. Vincent H. Malmstrom suggests that the date of August 13 (the following day) celebrated the birth of the "creation" of the world in 3114 BC (the end of the "second creation"). The "Day of Kan," was New Year's Day among the later Maya, celebrated on July 26th, and noted by Landa in the 16th century AD, when July 26th actually coincided with a "Day of Kan" on the Tzolkin calendar. But the "Day of Kan" only fell on this day every other decade (at twenty-year intervals). The "Day of Kan" is as much a generic name for the New Year Day, as it is an actual Tzolkin calendar day. "Kan" means maize (as well as "snake" and "sky"). I suspect that, well before 685 BC, the "Day of Kan" was already established as the day a previous creation had been renewed. After 685 BC, attempts must also have been made to again rationalize the start of the current creation to a "Day of Kan." The rationalization involved the simple suggestion that a day named Kan had fallen 12 days earlier, that is, it fell on July 14, Gregorian, 685 BC (the release of the plasmoid from Jupiter), which is 6.3.4.5.4 17-Chen 2-Kan on the August 13 Long Count (not on the August 11 Long Count). Of course, I am approaching conjecture here. But if I may be allowed to continue (and the following is not conjecture), I would suggest that the Olmecs kept daybooks, like the Babylonians, Egyptians, and other literate people. They could look up the records of the past. The documents of the ceremonial centers in the Valley of Mexico were only destroyed when the Aztecs arrived. The Maya records survived until the Spanish arrived. Only a last-minute transcription to the Books of the Chilam Balam has saved, for our benefit, a summary record of the past, dating back thousands of years. The Chilam Balam frequently makes casual references to actual dates and time intervals, indicating details which must have existed in the source documents. The Chilam Balam, in fact, provides five specific dates (as time intervals) for the summer of the year 685 BC. What might have happened 12 days before July 25th when the plasmoid bolt of Jupiter ended an era? What comes to mind, of course, is that the plasmoid lightning bolt must have taken some time to travel 484 million miles. The solar wind leaving the Sun travels past the Earth at about 2 million miles per hour. It apparently does not speed up significantly after passing Earth. If a bolt traveling from Jupiter also averaged that speed, it would take 10 days to cross the 5.2 AU distance to the Sun. The Olmecs, by selecting the primacy of the "Day of Kan," for July 14th, in effect are suggesting it took 12 days. Jupiter probably expanded its coma weeks before the return stroke was released. The specifics of the illustrations which were developed by the Olmecs, and which eventually became the religious iconography of the Maya, would require that Jupiter was clearly seen and recorded for a reasonably long period. From other alignments adopted after 685 BC, it would look like the date of the initial expanded coma was July 9th. The Chilam Balam seems to fully concur in this selection. At Monte Alban the rationalization of the Tzolkin calendar involved restarting the Tzolkin annually on August 14th. The fourth day of the Tzolkin, 4-Kan, would then fall on August 17th, the day when the Sun had passed overhead of Monte Alban in the era before 685 BC, when the Earth's axis was still at an inclination of 30 degrees. And the "Day of Kan," everyone knew, had started the current era, as it apparently had started every change in the constitution of the heavens, or so it was thought. After 600 BC the August 12 alignment was adopted at many locations -- but so were the three dates in July of 685 BC, and equally the date of September 8, which indicated the end of the "third creation" and constituted the completion of the previous world order. The dates of 1492 BC and 747 BC were known. The date of the end of the "third creation" (2349 BC) was selected on the basis that it involved a culmination of the Pleiades. Before 685 BC, that happened on September 8th, two days after the fall equinox of September 6th (15 days earlier than today). Directly after the summer of 685 BC, when the dome of the stars had rotated 15 degrees, the culmination occurred on about October 8th, and then started to drift later into the year with the precession of the equinox. A sunset location, corresponding to the culmination of the Pleiades, was first celebrated, correctly, as October 8th. Four sites use a setting location of October 8th as an alignment. A fifth site uses September 8th as the date of the culmination of the Pleiades -- information correctly gleaned from the Council Books and valid for the era before 685 BC. The new culmination of the Pleiades was October 8th, with the Pleiades setting at 13.3 degrees north of west. This 13.3 degrees north of west was adopted as a horizon alignment by four sites. Three later sites made corrections in about AD 100 to October 16th (at 16.7 degrees north of west), and then in about AD 400, Teotihuacan redefined the new setting location of the culmination of the Pleiades for the date of October 22 (at 18.7 degrees north of west). This was adopted by five sites in the Valley of Mexico, and remained in use for the next 1200 years without further corrections. I should also point out again that each sunset alignment and each of the setting location for the Pleiades was fitted to a mountain or volcano. But what about the "Day of Kan"? I think the obsession of Mesoamerica with the "Day of Kan" can be related directly to the cataclysmic event of 2349 BC, the end of the "third creation," the fall of the Absu, the flood of Noah. From this, and from retrocalculations of the event of 1492 BC, it may have been obvious that any era had to end on the "Day of Kan." Two data points define an infinite set of curves, but for humans the coincidence typically is overwhelming evidence that an established relationship exists. The Chilam Balam relates the "Day of Kan" to the time of the "second baptism," that is, the flood of Noah in 2349 BC. Much later recollections of the Maya of the Yucatan recall a flood which separated two eras. It is also referred to in both the Popol Vuh and the Madrid Codex. But the Chilam Balam is the most specific, assigning it to a Katun 9-Ahau, which can be placed to the Long Count date of 2.2.0.0.4 2-Kan on the August 11 correlation, although the year is incorrect. The year was retrocalculated to fit a July 26th horizon location. It is, in fact, as I have pointed out earlier, the only instance in the whole of the 5200-year Long Count calendar when the "Day of Kan" actually did fall on July 26th. What probably came down from remote antiquity, well before 1492 BC, was information about the end of the "third creation," the event of 2349 BC, what we know as "the flood of Noah." This had been the second "flood" and was a major marker in the histories of people throughout the world. The Israelites understood it as "the flood of Noah." China starts its history at this point. I have detailed this in chapter 20 and 21. For the Olmecs, one creation had ended and another one had started up, on the "Day of Kan."
"And then days of the year were introduced." It was this event which changed the length of the year from 240 days to 260 days. The 260-day Tzolkin was introduced, on September 6, 2349 BC, using a rotation of 13 days to follow the waxing and waning of the Moon (a coincidence or determined much later) and forming 260 separately named and numbered days to fill the year. It is difficult to imagine how soon this calendar was devised. But once established, the fourth day of the new calendar would celebrate the end of the third creation, and nearly 2000 years later would have become New Year's Day -- and the "Day of Kan," for as always, the fourth day of a Tzolkin calendar rotation is the day named Kan. It is thus very likely that this "Day of Kan" -- September 9, 2349 BC -- was the fourth day of a Katun named 9-Ahau. That also means that, as had (supposedly) happened in 3147 BC, the previous Katun would have been named 11-Ahau -- the Katun which always represented all of prehistory. This coincidence of ending an era with a Katun 11-Ahau would again be validated in 747 BC, when the same sequence of events would take place. The Olmecs did not count in days before 747 BC, they counted and kept records in solar years called "Tuns," and in 20-year periods called "Katuns." It did not matter if the year in previous ages had been 260, 273, or 360 days long. A Tun was a Tun, and the difference between the solar year of 2349 BC and the year 747 BC was 1602 Tuns. The time of the flood, what the Chilam Balam called "the second Baptism," was thus 4 Baktuns (4 measures of 400 Tuns) and 2 years in the past from 6.0.0.0.0, February 28, 747 BC. The event could be placed in 1.19.18.0.0. The "Day of Kan" would be 1.19.18.0.4, always the fourth day of a Tun. Using years of 365.24 days, the above event of 1.19.18.0.4 would fall in 2327 BC. Additionally, the day should have been September 8th, as we know from the same Mesoamerican sources. But the 2327 BC date falls erroneously on March 2. The second flood had nothing to do with July 26th. Yet this confusion existed. And here is what most likely actually happened: First, the Tzolkin calendar was started in 2349 BC, in fact it probably started with the day the plasmoid from Venus arrived, September 6, 2349 BC. Another, separate page of the Chilam Balam, dealing only with the end of the "third creation," states that "then days of the year were introduced." We can be sure that the people of Mesoamerica had been counting in "Tun" years since long before 10,900 BC. It is also obvious (or at least, to me) that after 3147 BC a 240-day calendar consisting of 12 rotations of 20 named days was in use. China's original calender uses a very similar rotation of 12 against 10. With the calamity of 2349 BC (and the first appearance of the Moon) an accounting of numbered days was added -- "days of the year were introduced." Thus, to the established calendar of 20 named days, a count of 13 numbers was added, representing a half period of the Moon. This resulted in 260 uniquely named and numbered days. The length of the year had just changed to 260 days. This is the Tzolkin, which fitted the year exactly. The 240-day calendar would have been 20 days shorter than the 260-day calendar. But this notion does not help in relocating the 2349 BC "Day of the Dead" so that we would end up with Katun 9-Ahau. The Tzolkin that we are familiar with must have started on September 6, 2349 BC. On the third day of the new calendar Jupiter returned from the dead. By this time the smaller plasmoids from Venus had passed, and the turmoil in the sky might have subsided. Thus the third day (September 8th) actually marked the end of the "third creation," and the next day would be "New Year's Day" of the renewed creation of the world. This fourth day was the "Day of Kan," as it always is for the first Tun of a new Katun. The fact that a Katun and Tun had just started on September 6 (the fall equinox before 685 BC) may be coincidence or it may be purposeful. It can be suggested that a new year normally started at the fall equinox. Since the previous calendar of 240 days rotated through the 20 day names 12 times, a new year would always start on day-name Imix. The fourth day would be Kan. Since the Olmecs already had a year-count of Katuns (20-year periods) and Baktuns (400-year periods) in use, it is possible that this was actually the start of a Katun 9-Ahau. Otherwise the notion that the "third creation" started in a Katun 9-Ahau might have followed from what had happened in 747 BC, when the Long Count was started at the beginning of a Katun 9-Ahau. I thought initially that perhaps I could just roll back the Tzolkin calendar from February 28th, 747 BC, compensating for the fact that the year was of a different length, and do a search for when in the remote past -- somewhere around 1492 BC -- a Gregorian equivalent day of April 19th would have coincided with a day named "Kan." But this yielded no sensible results. I subsequently considered that perhaps the Olmecs or the people of the Valley of Mexico might already have made the calculations using the Tzolkin and a record of events from antiquity. I thus checked the Gregorian date of April 19, 1493 BC (-1492 in astronomical nomenclature). It turns out to fall on 4.2.4.5.4 6-Kan (August 11 correlation). The day of April 19 will not again fall on the "Day of Kan" for 22 years before or 25 years after 1492 BC. Those applying the Long Count obviously had forgotten that the year had lengthened in 747 BC and the retrocalculations were performed as if the solar year had always been 365.24 days long. This would suggest that the retrocalculations for 1492 BC were made sometime after 685 BC. Of course, the remodeling of Monte Alban does not prove that by 275 BC the 360-day year had already been forgotten. Nor does the introduction by the Zapotecs of an annual version of the Tzolkin calendar, restarting each year on August 14th, so that the 4th day, 4-Kan, would fall on the Gregorian equivalent day when, 400 years earlier (as well as in 275 BC), the Sun had passed directly overhead at Monte Alban on August 17th. But being able to use the day number and a day name of Kan to coincide with a zenithal Sun at their sacred location was important enough to the Zapotecs to break faith with all the other tribes in Mesoamerica and refashion the sacred Tzolkin to their own needs. No other tribe ever did that. More on this further below. Working backwards with the Long Count notation, no "Day of Kan" can be found at 6.0.0.0.0 for 747 BC, except that a "Day of Kan" follows four days later (6.0.0.0.4) as it always does at the beginning of a Katun. What the event of 747 supplied was the start of an era in a Katun 9-Ahau. It should be noted that the Chilam Balam also places the events which follow directly after 3114 BC (or 3147 BC) in a Katun 9-Ahau -- despite the fact that the Long Count date of 0.0.0.0.0 (when retrocalculated on the basis of a 365.24-day year) starts a Katun 4-Ahau. Although there was no clear "Day of Kan" for 747 BC, the era-ending was celebrated with alignments to volcanoes and mountains at La Venta, Tres Zapotes, Cerro de la Mesas, Remojades, Zempoala, Tlatilco, Cuicuilco, and Tlapacoya -- 8 of the 13 sites I investigated. The Earth shock of 747 BC was not understood to be the end of a creation. The destructive close passes of Mars continued for another 60 years (as they also had preceded 747 BC by 60 years). There is virtually no mention of this event in the Chilam Balam and none in the Popol Vuh. Instead, it was the events of 685 BC which are brought forward as the relief from an impending end of creation -- or as an extension of creation. For 3114 BC no actual "Day of Kan" can be found. (I have to use 3114 BC here, rather than 3147 BC.) Of course the fourth day of the new era, 13.0.0.0.4, is 4-Kan.
Of the 13 sites I investigated, 8 have alignments reflecting some aspect of the August 12 or 13 date: La Venta, Tres Zapotes, Cerro de la Mesas, Teotihuacan, Tlatilco, Tizatlan, Cuicuilco, and Tlapacoya. At Tres Zapotes, which may have preceded La Venta, the zenithal sun passes over the site on August 13 before 685 BC. At La Venta there are two alignments representing April 19 (15.22 and 15.32 degrees north of west) before 685 BC. These were not corrected after 685 BC, but likely became the markers for an August 12 sunset. It is also possible (but unlikely) that the zenithal passage of the sun on August 14, before 685 BC, reflected in sunsets at 19.35 degrees (n of w) and 19.50 degrees (s of w), might have been meant to represent the date of August 13, but as the day after (thus a New Year's Day). Only at Tres Zapotes or at La Venta could the calculations have been made, after the institution of the Long Count, to find the day of the "second creation." To find the August 13 date, shortly after 747 BC, as was certainly done at Tres Zapotes, is rather stunning. First, because it assumes that the Olmecs wasted no time in the research potential of the Long Count, and, second that in a very short span of time the original length of the year, 360 days (whose measure was incorporated in the Long Count), had been forgotten. Having found, or verified, the "Day of Kan" for three past creations, the scribes and day-keepers seemed to have been satisfied, for these two dates were never again corrected or accessed. A more important problem came forward: What was the day which ended the most recent creation, the events which were witnessed in 685 BC? For this everyone had accurate records, to the day, and certainly for the sunset horizon locations. We could imagine a conference of scribes, recorders, and day-keepers from surrounding cities and ceremonial centers convened at Teotihuacan sometime during these centuries for the purpose of hammering out the theological difficulties. Most sites already had alignments established long ago, selected from four dates in 685 BC, and a large number which recalled earlier era-endings. The solution seems to have been to move the Long Count up by two days, by dropping what is known as the August 11 correlation for a competing August 13 correlation. This made it clear that the day Jupiter released its plasmoid thunderbolt, July 14, 685 BC, fell on the "Day of Kan" -- 6.3.4.5.4 2-Kan, on the August 13 correlation. I should note that, considering the sacredness of the Tzolkin, it would seem next to impossible that the Tzolkin could have been moved by two days, as I have described above. More likely the August 13 version arose from an early misunderstanding in its adoption by some tribes, although it would have to be at a time when the Tzolkin and Haab were already widely distributed. Possibly this happened in 747 BC, when some tribes did not acknowledge the two days which were missing because the sun had not risen as the Earth's axis went through a spin. The Long Count, where it was adopted, was added in each instance of its adoption to an on-going tally of the local Tzolkin calendar. The days of the Tzolkin (and the Haab) are the same sequence in both versions of the Long Count. The Zapotecs of Monte Alban must have worked under the same prohibition of interrupting the calendar. Thus when they switched over to an annual calendar which would restart every year on August 14th, this must have been done when the day 1-Imix, the first day of the 260-day Tzolkin, corresponded to our calendar day of August 14th. This happened only three times in a span of about 2400 years, in 439 BC, 523 BC, and 607 BC. Of these three, the last date listed, corresponds to the first archaeological dating of the site of Monte Alban. The Course of the "May"
We can thank the Olmecs for recording for us, in the site selections for ceremonial centers, the alignments of the heavens before and after the 7th century BC, and Vincent H. Malmstrom for pointing these out to us. In the following few paragraphs I will review the changes already noted above and in the previous chapter, but in a broader historical perspective. The sequence will be based on the fact that the interval between approaches of Venus was known by the people of Mesoamerica to be 52 years in an earlier era. The actual "Venus interval" at various times is detailed in Appendix B, "The Celestial Mechanics." "The Postclassic Maya destroyed the primate city and its road at the end of the 'may.' There are indications that this 'destruction' may have been largely ritual and symbolic, and that the 'abandonment' of the city was an evacuation by the ruling dynasty rather than total depopulation." I do not think we can hold that the later Katun endings used by the Maya could be extended backwards in time to San Lorenzo (but likely to the demise of Teotihuacan). But the concept of primacy of a single location seems to have existed. However, based on an inspection of spans of occupancy of various sites, I would suggest that we have to use a different cycle, not the rotation of 13 Katuns. Most appropriate, in the era when Venus was the main threat, this might have been an interval of periods of 52 years. As it turns out, a period of ten 52-year periods seems to have been in use -- 520 years -- which equals two cycles of 13 Katuns. Why this particular span of time? I do not know. The causes are lost in prehistory, but it seems to have had a certain urgency. It has been estimated that San Lorenzo was destroyed and abandoned in about 900 BC. The first Baktun and Katun ending in 8-Ahau after about 900 BC is 868 BC. Additionally, San Lorenzo was only in use after 1440 BC. If we use the first Baktun and Katun ending in 8-Ahau after 1440 BC, which is 4.9.0.0.0, 1367 BC, then the span of time to 868 BC is two cycles of 13 Katuns -- 520 years. With the establishment of the Haab calendar (of 360 days) after 1492 BC, the people of Mesoamerica recognized a "world ending" date, when the same day name and number on the Haab and Tzolkin calendars recurred -- a period of 52 years (initially using years of 360 days). This interval became high science for the Olmecs, as well as all the later people of Mesoamerica, and it had a certain numerological beauty. In fact, I suspect that the whole of calendrical history after 1492 BC, when the Haab calendar was established, lies suspended between math and magic. As I have pointed out in an endnote to the chapter "Language and Causality," colonial native documents which propose to reveal the history of the region in deep antiquity, as for example, the Annals of Cuahitlan, make claims to ages of the world which are uniformly reported as products of 52 and 13 years and their differences. We have no evidence that Venus might have aligned with Earth at regular 52-year intervals after 2193 BC. I have shown, in fact, that the period would have dropped to 47 (solar) years after 2193 BC, and was 50 years between 1492 BC and 1442 BC. (See Appendix B, "Celestial Mechanics.") Yet the expected end of the world was still celebrated at 52-year Haab intervals at the time of the Spanish invasion in the 16th century AD, even though by this time the dates of the "52-year round" had not coincided with alignments of Venus probably for over 2000 years. Except, of course, that Venus would still be seen rising at the same horizon location every 52 "years" on the Haab calendar. I dislike numerological analysis of ancient history, but, considering the seriousness with which the Mesoamerican people seem to have approached this subject -- to the point where almost all of the Maya monuments deal exclusively with time periods and Katun endings -- it might in this instance be appropriate. I'll follow Edmonson's suggestion of the existence of the "may," but I will not use a single cycle of 13 Katuns (260 years), but a period of 2 cycles of 13 Katuns, 520 years (2 * 13 * 20 = 520 years). This is also 10 cycles of 52 years, and this is probably what defined the "may" in remote antiquity. I'll start with the second "may" in order to settle some dates and practices. 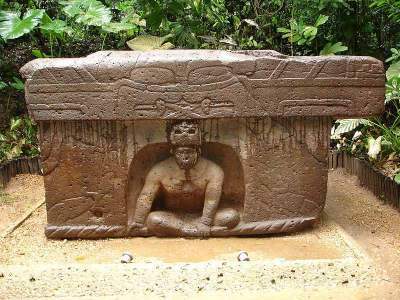 In Veracruz the oldest Olmec site, San Lorenzo, dating from around 1440 BC, shows two alignments with the mountains El Chichon and Zempoaltepec, for a date of an April 19 sunrise and sunset, recalling the start of the era after 1492 BC (actually the end of the previous era). An additional alignment with Popocatepetl signals the day (sunset) that the Sun passes directly overhead, on August 15. These alignments are for an axial inclination of 30 degrees. The actual "Venus cycle" after 1440 BC was probably 50 years -- if it existed at all. But the 360-day Haab had been devised, and the Olmecs were thoroughly convinced that the appearances of the celestial Gods followed their calendar. What I am suggesting is that the celebration of the "52-year interval" was most likely entirely ritualistic and based only on calendrical considerations. Thus, although the actual Venus cycle varies from 47 to 52 years, I have used a Venus cycle interval of 52 years throughout most of the chart presented further below. For the period of 2193 BC to 1492 BC I have used an interval of 47 years. This would be suggested from the fact that there was no Haab calendar until 1492 BC, and the intervals might represent actual sightings of Venus and would be counted in Tun years, representing solar years of whatever length. After 520 years of preventing disaster, the site of San Lorenzo became irrelevant, and in about 900 BC the ceremonial center was destroyed and abandoned. I would suggest the year of 847 BC, the end of a "may," a period which will fit exactly between an earlier and many later "may" periods. First then, a look at an earlier period. If San Lorenzo then held its period of primacy for "10 periods" of 52 years on the basis that some previous site had also held its primacy for an identical period of time (and was destroyed), what site was this? We do not really know, but it would have to be a site with an occupation dating back to about 2000 BC. A likely site might be located in the Soconusco region of Guatemala, along the Pacific coast and in a tropical region similar to Mexico's Veracruz. This includes Izapa, El Jobo, Abaj Takalil, Chocola, Chukumuk, Kaminaljuyu, El Baul, and Monte Alto, all of which are located along a 120-mile coastal strip (in that order). All the sites share the same art style, and share this with Tres Zapotes in Veracruz. Some sites are dated to have had their start in the period of 1850 BC to 1650 BC, thus 200 to 400 years before the establishment of San Lorenzo. But dates to 2000 BC have also been suggested. "... large rounded boulders, often 1.5 m (5 ft) or more in diameter, were selected as the medium upon which either the rudimentary features of a head or a body were etched out in bas-relief. Only a minimal amount of carving was done, so in all cases the faces have a decidedly bloated appearance and the bodies are corpulent." "The heads that were depicted tended to have a fairly similar, generic appearance. If they were intended to highlight any individual differences, their sculptors appear to have been singularly unsuccessful, although a few of the heads do have some strikingly unique characteristics." "The bodies, on the other hand, almost invariably have the arms wrapped around them so the fingers of the hands nearly come together over the fullness of their abdomens, and the legs and feet often do a similar encircling act near the base of the sculpture." 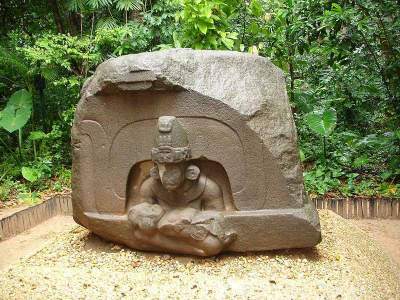 There are other large sculptures in stone in the Soconusco region, including heads, turtles, and reclining jaguars. But the collection at Monte Alto is amazing and unusual. The oldest of these are estimated to date to 2000 BC. The collection of "fat boys" suggests that, like at the later San Lorenzo, these might represent efforts at staving off the destructions which might have resulted from the expected passage of Venus at 52-year intervals. The sculptures would have been created over the course of 520 years, the term of the primacy of the site. Elsewhere I have developed that in 2349 BC and 2193 BC (and in between) Venus made electric contact with Earth. That period would have observed four possible interactions with Venus. What I have also developed, in Appendix B, is that until 1492 BC, Venus would cross Earth's orbit regularly. This would not cause electric contacts, but Venus would have loomed very large in the sky at infrequent intervals. Likely this interval was 52 years, or more likely it was 47 years at that time. Perhaps the preventive measures were initially (during the period between 2193 BC and 1492 BC) based on observation of a 47-year cycle. After 1492 BC, the Venus cycle changed again, but the newly established Haab calendar could track the interval correctly. If during a 520-year period ending in 1492 BC the fat boy bodies were carved to coincide with the 47-year intervals, then we could divide 520 years by 47 to find that 11 sculptures would have been carved. Eleven heads and bodies have been found. Assuming that the primacy of Monte Alto indeed extended to 520 years, then it seems that the efforts at the prevention of disasters carried right through the Pacific contact by Venus of 1492 BC which sent tsunamis across the Pacific, reaching to China, and certainly the whole of coastal South America and Central America. This may have been the event which made the shamans of Monte Alto conclude that the effectiveness of their services had come to an end. Did this happen in a Katun 8-Ahau? Another solution, in line with later practices, would be to suggest that the nearest "8-Ahau" closing date after 1492 BC or 1442 BC would be in 1367 BC, the year 4.9.0.0.0 8-Ahau. Baktun 4 and Katun 9 were known, as was the fact that the last day of the Tun was 8-Ahau. Perhaps this showed that a site could only hold its mandate until ten cycles of 52 Tun years had lapsed and 8-Ahau was reached. Following the event of 1492 BC, the Haab was established, and now a rotation through the two calendars would repeat any Tzolkin and Haab day name-number every 52 Tun years. The knowledge that, 700 years earlier the potential end of creation had indeed occurred at 52-year intervals, now became the method of choice in warding off the end of creation at San Lorenzo. Venus, however, never again crossed Earth's orbit after 1492 BC or 1442 BC, and the interval between approaches after 1492 BC was not 52 years, but 50 years. Actually, it seemed not to have mattered, what the calendars predicted was important. An Earlier "May" Period before 1887 BC. If indeed the site of Monte Alto in Guatemala was established in 1887 BC, then we can count another 520 solar years back from this date. That takes us to 2407 BC, 52 years before the plasmoid of Venus landed in 2349 BC. Seeing Venus overriding Earth's orbit (without a electric field contact) might have been enough to establish that date. On the other hand, since at this point we are losing track of ancient history as determined by well known catastrophic events, it might be of use to suggest other events. What comes to mind as a near coincidence is the length of time that the three ball plasmoids in the south stood in the sky before collapsing. In the first century AD the Egyptian Stoic philosopher Chaeremon suggested 500 or 540 years. The three periods would have to fit between 8347 BC and 10,900 BC (approximately 2550 years). I will suggest that the actual length of each of the three periods might have been 520 years -- or at least the last one. The Olmecs or their predecessors were the only people on Earth to record details of the three southern plasmoids, their names, and their movement -- to be presented in capsule form 14,000 years later in the Chilam Balam. And, like many other people, they kept track of expanses of time -- huge expanses. If Josephus in the first century AD can offer a count of 1656 years between creation and the World Flood (even if applied to the wrong events), then certainly the Olmecs could count 520 years as the extent of the visibility of the southern ball plasmoids. Counting, as we saw in the decorated caves of western Europe, was high science. And counting establishes history, even for people who had no subjective consciousness and otherwise could not place themselves in a continuum of time. Thus it is likely that the 520 year span of the 'may' represents a celebration or commemoration of the existence of the "first creation." It is easier to identify a site which takes on primacy after San Lorenzo. The most likely choice seems to be Tres Zapotes. The site is located so that a zenithal passage of the Sun happened on August 13 during the time before 685 BC (and rose out of Vulcan San Martin Tuxtla). There is also an alignment for February 28, also conformed to the era before 685 BC. Strangely, there are additional alignments, also for before 685 BC, for July 25 (two) and July 9th. I would suspect that the site was relocated advantageously to pick up these additional alignments. 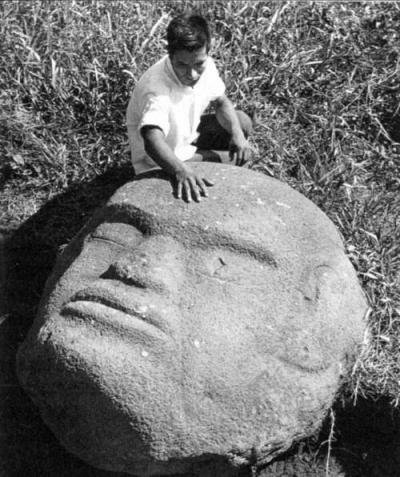 It might be suggested that an unusual head ("Monument 1"), found at Rancho La Cobata, near the site of Tres Zapotes, was originally destined for delivery to Tres Zapotes for a Venus ceremony in 712 BC, but was never delivered -- because in 747 BC Tres Zapotes was destroyed. Rancho La Cobata is thought to be a stone workshop for Tres Zapotes. The head found at Rancho La Cobata, and the two found at Tres Zapotes, are local and similar in style, differing from those found at San Lorenzo or La Venta. The head at Rancho La Cobata is absolutely enormous. It stands over 11 feet high, whereas the heads found at San Lorenzo vary from 5 feet to 9.5 feet (1.5 to 3 meters) tall and the heads at La Venta vary in height from 5.5 feet to 8 feet (2 to 2.5 meters). But what is most unusual is that, unlike all the other heads, it was carved with closed eyelids and with a down-turned mouth similar to the "snarling" down-turned mouths found on the "were-jaguar" sculptures at San Lorenzo and La Venta. It is the face of a dead person. This giant 11-foot-high boulder may have represented the death of Venus after the electrical jolt between Mars and Venus in 776 BC. The massive lightning bolt to Venus, which carved the 3000 miles long and five miles deep Valles Marineris on Mars, would have dropped the coulomb charge of Venus. Venus would have gone (even if only temporarily) to dark mode and lost its coma and tail. The lightning bolt (originating at Mars) would have been seen traveling toward Venus for twenty minutes to a half hour. On the other hand, the bolt from Jupiter in 685 BC also was clearly seen to end the brilliant display of Venus and Mercury, and was likely understood as representing the end of threats by Mars (so reads the Chilam Balam), but killed Venus also. This head could thus also be dated to the second occupation of Tres Zapotes. However, it seems that after 747 BC La Venta became the next center for the prevention of celestial disasters. Actually, La Venta had been established earlier, and it may have become the new religious capital by default. The change in primacy was unexpectedly soon, certainly not the 520 years that San Lorenzo had been in use. La Venta became a primary ceremonial center after 747 BC, and certainly a likely founding date for La Venta, as a ceremonial center, would be 747 BC. The site was selected to have alignments for April 19, 1492 BC but also for February 28th, 747 BC. The alignments were conformed to an axial inclination of 30 degrees. What is somewhat strange is the apparent switch at this time from Venus heads to Mars heads. The 52 Tun-year anniversaries were still celebrated, but with "creation" altars. There would have been five opportunities to carve a head representing Mars (not Venus) and prevent disasters after 747 BC, if the date of 747 BC is included. Certainly Mars was prevented, through whatever ceremonies, from becoming "the God of hell" (as the Chilam Balam calls the attempts by Mars at ending creation). I only slowly became convinced that the "heads" represented Mars ceremonies, and the "altars" represented Venus ceremonies. I'm inclined to think that the altars, already in use since San Lorenzo, represented "renewals of creation" ceremonies. This is still being celebrated today by Maya shamans, using, as earlier, an altar oriented to the cardinal directions. Eight or nine basalt altars have been found. The ninth is not certain. 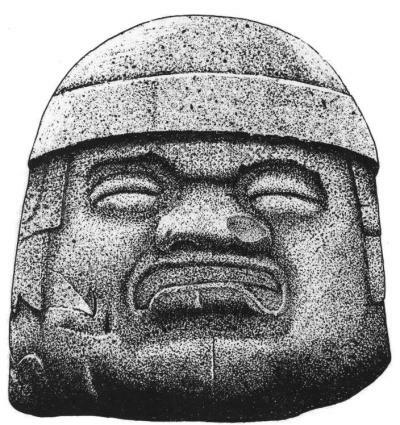 David C. Grove, in "Public Monuments and Sacred Mountains: Observations on Three Formative Period Sacred Landscapes" (Social Patterns in Preclassic Mesoamerica, 1999), suggest 8 "altars" for sure, of which five are "table top" versions, six feet (2 meters) high and 12 feet (4 meters) wide (whose "purpose [is] still unclear to archaeologists"), with a projecting upper ledge, and a front niche -- like a cave entrance -- with a seated person. Four of the altars are positioned in pairs, where one has a person appearing from the cave-like opening, and the other is a "presentation" scene, with the person holding a were-jaguar infant. All these altars are located south of the La Venta pyramid (the heads and graves are north of the pyramid). The altars are reminiscent of the 'creation' altars built by Maya shamans today. If the Olmec altars celebrated recreations of the world at 52-year intervals, then seven altars would span 747 BC to about 400 BC, when La Venta was abandoned. If started in 712 BC, the 6th altar would date to 400 BC. At a height of six feet, these are neither altars nor kingly thrones (as some archaeologists hold), but models of the raised sky. At any rate, only six or seven kings in 350 years is not likely. Grove also notes that the table-type altars, with the exception of the fifth altar, are always placed in sets of two, the first with a person peering out of the cave, facing the second where another person holds a were-infant on his lap. The pairing may be a coincidence, although this happened at San Lorenzo also. Even though I do not have enough altars, I'll assume that they were created every 52 years as single pieces rather than in pairs. The theology of the Olmecs changed after 685 BC at La Venta as everywhere else in the world. The emphasis changed from warding off Mars to celebrating Jupiter as the God of deliverance. This resolved at Teotihuacan, some 400 years later, to considering Quetzalcoatl, Venus, as the savior God through his self-sacrifice. The understanding reached in Mesoamerica of the events of 685 BC was in essence no different from the understanding achieved in the Eastern Mediterranean region. The missionaries who followed the Spanish invasion after AD 1500, quickly understood the philosophical underpinnings of the Indian "idol worship," and at first considered that Christ had perhaps appeared to the Mexica and the Maya independent of his appearance in Israel. When the inclination of the Earth's axis changed to 23.5 degrees after 685 BC, La Venta was remodeled (and the first monumental construction was started), aligning the long axis of the site to be at a right angle to the new horizon location for the date of February 28, 747 BC. The zenithal Sun still set in the volcano San Martin Tuxtla. The giant heads and the "number 9 Jaguar" mosaics, all of which were likely created after 747 BC, were retained or relocated. The carved monuments at La Venta clearly recall the events of 685 BC. This is shown in the iconography of stela and engraved ceremonial objects, and, in fact, by the creation of the first pyramid in Mesoamerica. The pyramid, a "red house," is the image of the lower plasma expulsion of Jupiter in 685 BC. After having prevented the ending of creation in the era after 747 BC, and no doubt continuing with other functions for an additional 300 years, the religious utility of La Venta eventually also came to an end. The "may" came to an end. There was no reason to carve additional stone heads. The shamans knew, too, that the site was not aligned with what was now considered the newest location of the end of the previous creation. There were no alignments to the dates of 685 BC at La Venta. When was La Venta abandoned for another location? Archaeology suggests 400 to 300 BC. That suggests 7 periods of 52 years after 764 BC, when La Venta most likely took over the mandate from Tres Zapotes. If we carry the 520-year period forward from the ending year of 868 BC at San Lorenzo, the end of the "may" would fall in 334 BC for La Venta. What is interesting, with respect to the status of La Venta, is an obscure reference to the ending of the second and third 52-year period at La Venta from inscriptions at the Maya site of Yaxchilan, 1300 or 1400 years later. At a number of Maya ceremonial sites, ballcourts are named as "First Conquest," "Second Conquest," and the "Third Conquest," and more frequently just as "Third Conquest." At the Maya site of Yaxchilan, three ballcourts are inscribed with a dedication date of October 21, AD 744. My first guess was that the date of AD 744 might have represented a multiple of 520-year intervals ("may cycles") since some important date in antiquity, especially since dates were in each case appended to indicate the first manifestation of the event significant to each of three ballcourts. The appended dates all point to the seventh century BC. As a matter of fact, AD 744 is 3 times 520 years (1560 years) since the first manifestation of the first colossal head at Tres Zapotes, in 816 BC. "Conquest," as Schele and Freidel note, in Maya Cosmos (1993), was originally translated as "Creation" -- creation of the world -- which is probably more correct in the context I am presenting here. Schele and Freidel note that "manifest" might also have been intended. I would easily suggest "Reign." I have estimated that first, second, and third "Creation Altars" were built at La Venta in 712 BC, 660 BC, and 608 BC. These might have been recorded in ancient records as the "first," "second," and "third anniversary" of "creation" or misread as the actual creation dates. Information on these ventures was available to Maya sites through copies of "The Council Book" which, since 747 BC, had recorded events at La Venta by Long Count dates. The distance numbers of the Long Count dates of the three ballcourts are incomplete, so that at best Schele and Freidel could only suggest "1400 years before" the dedication date of the ballcourts in AD 744. That places the dates of the original "First Creation," "Second Creation," and the "Third Creation" in the era when La Venta was the center of religious activity. As Schele and Freidel point out, the calculations based on distance numbers do not match the Tzolkin and Haab day names and numbers of the inscriptions. The three Tzolkin/Haab dates are 13-Manik 5-Pax, 9-Kan 12-Xul, and 1-Ahau 13-Xul. The date for the "Third Creation" is correct at 608 BC. This is (or should be) the date of the third altar in a series that was carved at La Venta. It would seem from this that a "Third Creation" was thus correctly pinpointed by Yaxchilan even though it was not the "third creation" they were looking for. They were looking for the date when the sky had turned red and fallen to Earth in 2349 BC. I think the scribes at Yaxchilan made a serious mistake. They were looking for the ending dates of the "first creation," the "second creation," and the "third creation," which would have been the years 8347 BC, 3147 BC, and 2349 BC. These three are the recognized completion dates for the "first creation," "second creation," and "third creation" as we know from other sources. The scribes checked their records, the same records which had been recorded at La Venta and transcribed by others, eventually to be confused as the complete history of humanity. Some of the books, without giving dates, indeed did record events dating back thousands of years, but references to the first, second, and third creation were recorded also for ceremonies at La Venta in the 7th century BC. The dates were transcribed by Yaxchilan without a single thought about the actual scope of history. More importantly to compound the error, the records might have been "corrected" by the scribes at Monte Alban to conform to their particular calendar. This might have kept the years to more or less the same values, but would have jumbled the Tzolkin/Haab day names. Let's follow this trail in the manner told in the Guatemalan Popol Vuh. I would assume that the scribes at Yaxchilan derived their information from books obtained from Monte Alban, but these books described information originally obtained by Monte Alban from La Venta. Those same books might repeatedly have been recopied before reaching Yaxchilan, but they were held as sacred and true. The books told of how the leaders (of Monte Alban) traveled east to the city by the sea (La Venta) to obtain their insignias of leadership. Received from La Venta were the "Council Book," and books called "The Light that Came from Beside the Sea," "Our Place in the Shadows," and "The Dawn of Life." The books revealed the most ancient of history, the experience of darkness, the migrations of the tribes, the genesis of the Gods, the founding of the calendar, the "third creation" -- but all from records derived from La Venta. The books were probably not transmitted until hundreds of years had passed, and with time the stories they told were taken as the history of those who received the copies. The dates match. Monte Alban was active before La Venta was abandoned. It was at Monte Alban also where a script was developed. The Tzolkin and Haab calendar was not received from Monte Alban, for everyone already had the calendar, as shown by the fact that the August 11 version was in use in both the southern Veracruz region (as at La Venta) and in part of Guatemala, whereas the Valley of Mexico and the Guatemalan Peten and the Yucatan region used the August 13 version. The "may" ended in AD 179 for Monte Alban. But Monte Alban was not destroyed after AD 179, but held on to AD 700 or AD 1000, after which it was mostly abandoned. By the 16th century AD there was still a priestly college in the Oaxaca region, which seemed to have remained unmolested by the Aztecs. Interestingly, Monte Alban did not go into a decline until AD 700, suggesting that perhaps it held the "may" for two periods, from 334 BC to AD 179, and from AD 179 to AD 692. This last is the same period when Teotihuacan obviously held primacy. Perhaps this is an instance of the regionalization of the "may" since Monte Alban was a considerable distance from the Valley of Mexico. Because of my use of the Gregorian (Julian) calendar at this point in time, the "may" since La Venta is reduced to 513 calendar years. Clearly it was Teotihuacan which held the "may" from AD 179, to be abandoned, "conquered," in AD 692. As I have noted, Teotihuacan was one of the three largest cities in the world. Teotihuacan established a widespread trade network across Mesoamerica. There was a population of Monte Alban craftsmen in one of the precincts of Teotihuacan. Following the Post-Classical usage by the Maya, it would seem that by "conquest" is also meant the destruction and abandonment of a ceremonial site after some period of use, as Edmonson has suggested. This has been seen in the case of San Lorenzo and La Venta, and has recently been suggested for Teotihuacan in about AD 700. At an earlier time the destruction had been attributed to the Toltecs who invaded the Valley of Mexico. Today it is attributed to the priests of Teotihuacan. Assuming that the cycle of primacy is indeed 520 years, it could be suggested that Teotihuacan took on primacy shortly after AD 172. This agrees, in fact, with the archaeology of Teotihuacan. When Teotihuacan was abandoned in about AD 700, the Pleiades passed directly over the city at culmination. When Tula was constructed 200 years later and at a half degree further north in latitude, the Pleiades passed directly overhead of the new ceremonial center. The word "Tulan" or "Tollan" means "place of the reeds" or "place of the rushes." It had been applied to Teotihuacan also, and the later Aztecs applied it to their own city of Tenochtitlan (today Mexico City) as well. Not much is known of Tula since the Aztecs plundered it for building material and sculptures. Nine intervals of 52 years had passed since Teotihuacan was abandoned, when Tula was conquered by invading tribes. The architecture of Tula subsequently shows up at the Maya site of Chichen Itza. Cholula was a very large city southeast of the Aztec city of Tenochtitlan, and only a little smaller than Tenochtitlan in the 16th century AD. Dating from about 200 BC, it lasted to the time of the Spanish invasion. "Cholula remained a regional center of importance, enough so that, at the time of the fall of the Aztec empire, Aztec princes were still formally anointed by a Cholulan priest" (Wikipedia). Cholula probably had a population of near 100,000. The center included the largest pyramid in the world. Cortes reported counting 430 temples (there were only 365). When Cortes arrived, he massacred 3000 nobles and priests of Cholula in two hours, to demonstrate to the neighboring cities the invincibility of the Spanish. Edmonson suggests that the Maya may have redefined the "may" to a reduced period, as little as a single twenty-year Katun, rotating primacy among 13 prominent sites, although there also was a much longer period. Among the Maya the long 520-year period of the "may" seems to have been defined from the time of the fall of Tula (AD 1170, with AD 1204 as the end of the "may"). Edmonson identifies Mayapan of the (Maya) Itza as holding primacy from AD 1243 to 1752, a 509-year period, starting in a year 6-Ahau (20 years after 8-Ahau) and ending in a year 8-Ahau (and thus one Katun short of 520 Tun years), even though Mayapan was deserted during the last 300 years. The Toltecs in the Yucatan (remembered later as the Itza) used the start of the 11th Baktun (11.0.0.0.0) as the start of a "may." Edmonson further shows both the startup and the collapse or abandonment of numerous sites in the Yucatan as coinciding with Katuns ending of 8-Ahau. It could be suggested that the Classical era Maya sites in the Peten fully expected to last to the end of the next 520-year interval after the "conquest" of Teotihuacan, that is, to AD 1212. None of the highland Maya sites did. They all floundered and were abandoned by about AD 900. What will be seen in a list (below) of ceremonial centers and cities, is a sequence of events which promotes each city in turn to the status of a major center of activity and extended hegemony for a period of somewhat under 520 years, after which it disappears from view. As a primary center, they were consistently the largest and most populous sites, they conducted trade over nearly all of Mesoamerica, and were widely influential in promoting their architecture and their iconography, and -- we would presume -- their religious ideas. Over a period of 3000 years, the expectations of the sequence of the "may" in almost all instances matches the archaeological dating, although it is not always quite clear-cut. Some sites are already established at the start of a "may," but others, like Teotihuacan and Tula spring into existence as new ventures. Probably more important is that San Lorenzo, La Venta, and Teotihuacan clearly were destroyed by the residents or the leadership of the centers. The destruction of Tula, although at about the right time for a "may" ending, is today attributed to other invading tribes. As time progressed, hegemony over the region is expressed more and more with force, culminating with the extreme militarism of Tula which extended its control into Guatemala and even into the Yucatan region of the Maya. The later Aztecs took up the concept of military control after the fall of Tula, and claimed themselves as their descendants. Cholula seems to have avoided militarism, since it existed in the shadow of the Aztec empire. Abandoning a site after a set span of time is a concept entirely foreign to our way of thinking. It is a disruptive, self-defeating, and senseless gesture, and can only be understood if seen as a religious necessity. The nations of Europe often act the same way, but somehow their religiously based actions make more sense to us. The following table lists Katuns ending in 8-Ahau and anniversaries of the 52-year Venus cycles, in addition to a few other events. The 52-year intervals, shown below, are based on "Venus cycles" in solar years before San Lorenzo, and on 52 calendar years afterwards. 1.17       2407 BC  possible start of an earliest "may"
2349 BC      (*) The "flood of Noah"
4.9    1367 BC  end of the "may"
5.15    847 BC  end of the "may"
7.1     334 BC  end of the "may"
8.7     AD 179  end of the "may"
9.13    AD 692  end of the "may"
10.19    AD 1204  end of the "may"
our calendar is 513 years. Note 2: Prior to 2193 the "Venus cycle" consisted of 52 solar years. Note 3: For the period of 2193 BC to 1492 BC, the "Venus cycle"
is based on an interval of 47 solar years, marked #. Note 4: After 1492 BC I have used a 52-year "Venus cycle." The "years BC" for the 8-Ahau Katuns listed above are corrected by assuming, as would be the case before 747 BC, that the Baktuns and Katuns represented actual years, that is, solar years. This matches dates from the Eastern Mediterranean, where the "BC" notation is also in solar years (today under the assumption of an invariant year length). The 52-Tun-year anniversaries of Venus are shown in BC/AD notation, and are thus approximate. Since the final celebration in the Valley of Mexico happened in AD 1507, my series of 52-year anniversaries, which ends in AD 1472, is off by 35 years near the end. I have added Malmstrom's derived dates for the period after Teotihuacan. From this table it would be clear that primacy of a site is concluded after the 10th anniversary of the 52-year Venus cycle, whether the cycle existed in reality or not. This assumes a missing primacy between La Venta and Teotihuacan, for which I have suggested Monte Alban, although Tres Zapotes was also revived. Considering the role played by San Lorenzo and La Venta in the maintenance of creation and prevention of the destruction of the world for over 1000 years, it becomes obvious that these two sites were very important and influential, and possibly would have set the religious agenda for Mesoamerica for the following 2000 years. As I have noted earlier, most of the other Olmec sites, and most of the sites in the Valley of Mexico, show the same concern with "era-ending" alignments similar to what was incorporated in the choices for the location of San Lorenzo, Tres Zapotes, and La Venta. The alignments established at San Lorenzo and La Venta became the minimum required alignments. After 600 BC new "era-ending" alignments are added, reflecting dates from the year 685 BC. It could be suggested that the older horizon locations (like for April 19, 1492 BC, or February 28, 747 BC) were simply copied from the older sites, except that we start to see these older alignments being conformed to the new axial inclination of 23.5 degrees, just as we also see some of the newer "era-ending" dates configured to horizon locations conformed to the old axial inclination of 30 degrees. This is a truly strange procedure, and it is almost beyond the imagination to attempt to understand how the alignments for the previous era could have been found geometrically. But it is clear that it happened. We also have absolutely no idea what was so important about establishing these site alignments. Orientation of the major axis of a site would be the easiest method of forcing the "proper" layout of a ceremonial center, one which did not require triangulation with two or more mountains. There might have been many more than the few I have noted. Unfortunately I am lacking axial locations of site orientations except for a few well-studied sites and I may be missing additional horizon alignments because of this. The alignments used to signal the end of yet another creation were not immediately obvious after 685 BC. Which date to use, and how it reflected new developing theologies, remained a question. Using two revolving calendars which did not match the solar year did not help to resolve this initially. There were many understandings of what had happened, and many solutions. We also do not know how these calendars were used. Probably the alignments implemented by Teotihuacan were adopted by the Maya in the Peten and on the Guatemalan coast, due to the hegemony that Teotihuacan exerted over much of Mesoamerica. Again, I have also not followed up on site alignments in the Yucatan or Guatemala. The alignments found for Veracruz and the Valley of Mexico were, I felt, sufficient to establish the importance of site alignments, but especially to demonstrate the change in the inclination of the Earth's axis of rotation. The events of 685 BC were of course written down. There would have been day books, records of events by years and by days. Narrative versions probably came much later, and likely encompassed all of sacred history, from the first creation onward. The understanding of what transpired in 685 BC probably took many forms. But everything that was told in the narrative could be verified. What does all this mean? It means that we are dealing here with able historians, excellent geographers, superb observational astronomers, and astute mathematicians. Before the Spanish destroyed all their records, these Stone Age people had the longest continuous historical records in the world, the only accurate record of past celestial events, and the closest observations of the Sun. We only need to get past their quirky concepts of geography, and their strange notions of cyclical time and disregard of the actual length of the year, in order to extract information which other nations of the world have failed to record or make sense of. The misapplied science involves the use of the August 13 correlation. It is the only one where the day-names hold up. It differs from the August 11 correlation, which was certainly in use in 747 BC, and had spread with an attached Long Count to Guatemala before 600 BC. The Olmecs, and certainly the later Maya, were perfectly capable of dealing with the 0.24 fractional day. So says Michael Coe. The Maya used ratios to approach the values of numbers less than one, similar to the Egyptian use of additive fractions in doing division. The association of the "Day of Kan" with the flood of Noah (the fall of the Absu) is not entirely certain from a reading of the Chilam Balam. Katun 9-Ahau is clearly identified, however, and this is immediately followed by, "Kan was the day when its burden was bound to it," after which follows, "Then the water descended, it came from the heart of the sky for the baptism of the House of Nine Bushes." It is quite possible that the (supposed) sentence about the "Day of Kan" belongs elsewhere in the text. (All sentence punctuation is missing from the "Chilam Balam" and the order is systematically jumbled.) The fact that the opening "Day of Kan" falls in Katun 9-Ahau, 2.2.0.0.4, would argue against this, however. The use of the August 11 correlation used to find these two day names in remote antiquity is another sign of the disagreements in Mesoamerica about the actual ending date of the era before 747 BC. After 747 BC the Day of Kan coincidences are to be found only with the August 13 correlation. All people do this: find similarities, and assume a connection. We frequently make these connections on a very slim basis. The Olmecs had assumed that a flood would separate recreations of the world, based on the flood of 3147 BC and the celestial flood of 2349 BC, which last had also caused incessant rains and storms. The Chilam Balam still acknowledges this connection, offering events surrounding 2349 BC as the "Third Reign." But the Earth shock of 1492 BC had not involved flooding of the scope of the previous era-endings, although the west coastal regions of the Americas were buffeted with massive tsunamis. With the shock of 747 BC any global flooding was missing, except, of course for the hurricanes due to the electrical arc from a passing planet. "From field measurements begun in 1971, Aveni was able to confirm that 50 of 56 sites which he examined were indeed oriented east of north, and that a 17-degree 'family' of alignments did in fact seem to exist (Aveni 1975) [Antoni Aveni, ed. Archaeoastronomy in Pre-Columbian America (1975)]. Aveni also concluded that this particular pattern of orientation seemed to be most prevalent in the Valley of Mexico and he specifically mentioned Tenayuca, Tepozteco, and Tula as sites where this alignment was encountered. (It should be pointed out that Aveni's '17-degree family' of alignments includes orientations as far off as 15.5 degrees, [azimuth of 285.5 degrees, less 270 degrees] for he includes Teotihuacán in this 'group'.)" "Aveni has had to dismiss all later sites built on the Mexican plateau having similar orientations to Teotihuacan (such as Tenayuca, Tepozteco, and Tula) as being simply 'non-functional imitations' of the great Mesoamerican metropolis (Aveni 1975)." It is difficult to believe the chauvinism that a statement like this reveals. Aveni's alignments are reproduced in Skywatchers of Ancient Mexico (1980). "Of these two possibilities, the latter is definitely the more interesting to students of Mesoamerican calendrics. This is because the Maya -- the most highly advanced of all Mesoamerican peoples in the realm of astronomy -- believed that the present era of the world began on August 13, 3114 B.C., according to the Goodman-Martinez-Thompson correlation between the Maya and Christian calendars." "... recurrent building alignments throughout Mesoamerica appear to commemorate a date which can only have had astronomical (solar) origins or, at the very least, could only have been established by astronomical means -- that is, by counting the number of days from some fixed point in time. (In the latter regard it should be pointed out that the August 13 sunset position could easily have been defined simply by counting 52 days from the summer solstice.) In the light of the evidence at hand, one can conclude that far from being just one more in a series of 'coincidences,' the correspondence of building alignment azimuths throughout Mesoamerica and the beginning date of the Goodman-Mart�nez-Thompson correlation should more realistically be considered as additional proof of the validity of the latter." For the locations where I have accurate alignments based on current GPS data, I arrive at a date of August 12, not 13. August 13 is the day after, and thus after the "completion" of the previous era. Munro S. Edmonson, "Some Postclassic Questions About The Classic Maya" (Fifth Palenque Round Table, 1978). "The seat of the Katun ('hetz' Katun) was the real capital of the region in Postclassic and Colonial times. Though it only served for 20 Tuns at a time, each city competed vigorously for the honor, since it conferred tribute rights and the right to confirm titles to land and public office throughout the region. While these rights must have belonged to ruling lords of major centers, there may nonetheless have been some ritual rotation of subsidiary responsibilities among the cities of the second rank." "Councils of sages and prophets were held at Mayapan and Chichen Itza in 13 Ahau (1539) and at Merida in 7 Ahau (1579). Such councils were apparently called in times of crisis to resolve calendrical and religious issues, and one such may well have been responsible for the founding of the League of Mayapan in 2 Ahau (1263). They appear to have resembled the Vatican Councils in function, and they commanded enormous respect, representing in Colonial times the highest moral authority in the country. Such a body might for example have had a role in the investiture of the rulers in Classic times as well as later." "The ritual importance of the Katuns is fully attested by Katun ending monuments. Perhaps some of these contain texts with the curious blend of prophecy and history presented in the Books of Chilam Balam." "[A] table has been drawn up as a documentation and speculation in relation to the recurrence of the 'may' cycle ending on 8 Ahau Katuns and its possible relevance to the chronology of Maya history. As is summarized in Table I in the text, it is possible to consider eleven such cycles within the framework of Middle American prehistory, from the ninth century B.C. to the twentieth century A.D. The eleventh such cycle would be completed in 2016 A.D., according to the most recent Maya calendar reform, that of Valladolid." The interval in solar years will match the count recorded by the Olmecs in "Tuns," since a Tun is (was) a (solar) year. Their records would thus match the chronology of the Eastern Mediterranean region. After 1492 BC the year went to 360 days, and a Tun was still a solar year. After 747 BC, when the Long Count was established, the Tun of the Long Count tally was retained at 360 days, even though the Haab year went from 360 to 365 days in 747 BC. Is that interesting and indicative of the process? "Only two unequivocal tabletop altars have been found at San Lorenzo. Monument 20 (Type B) was found in the far northwest area of the plateau. Monument 14 (Type A) is positioned in the west-central sector of the site. Although separated by more than 400 meters, these two altars are in a virtual north south alignment." At 52-year intervals, the ten altars represent 520 years. We would do well to recognize 'altars' as marking 52-year intervals in the future, after San Lorenzo. How correct could I be about the number of heads found at San Lorenzo, Tres Zapotes, La Venta, and Monte Alto? In originally writing this chapter I guessed from calendar considerations at the number of heads at each of these locations without prior knowledge of how many there were -- San Lorenzo: 10 or 11 heads (10 have been found); Tres Zapotes: 2 heads (two have been found); La Venta: 4 or 5 heads (four have been found), and 7 altars (eight have been found); and Monte Alto: 11 heads (eleven have been found). "In the Post-classic the seat of the cycle for the Itza, the 'Well of the Cycle' or 'Mayapan' from 1243 to 1752, was not even inhabited after 1452, but it continued to serve as a symbol of the religious authority of the 'may' for another three hundred years." One would think that the 300-year abandonment of Mayapan, during which time it was still recognized for its "authority," would have hinted at a longer cycle, as plainly as the 509 years of its life. Peter Furst, in an essay "The Olmec Were-Jaguar Motif" in Dumbarton Oaks Conference on the Olmec (1967), argues the opposite: that statuary shows the human face as having been flayed to reveal the "inner jaguar" and reads this as a shamanistic motif. At Teotihuacan warriors start using the flayed human face as a shield, and introduce this to the Maya during the Classical Period. Not to be dismissed is that the Olmecs represented an influx of West Africans, who brought their language and script, but adopted the local calendar and history books. See, for example, the writings of Clyde Ahmad Winters on this, as Atlantis in Mexico (2005). The July 25 alignments and the July 9th would have been instituted in the second occupation of the site. The alignment for an axial inclination of 30 degrees probably reflects a convenience in rebuilding the site after 747 BC. William Mullen in "Catastrophism and the Compulsion to Meaning" (Kronos, Vol. 6:1, 1980) wrote, "Much of the Early Tres Zapotes level was sealed with volcanic ash." He also notes the deposition of bitumen or asphalt. Bitumen is not volcanic. There were two occupations of Tres Zapotes. Bitumen was also found at San Lorenzo (Coe). The "First Creation" date of 13-Manik 5-Pax first occurs on 5.17.6.0.7 (802 BC), and every 52 years after. The second instance (5.19.18.13.7) happens in 750 BC. This is three years further in the past than the appearance of Mars in 747 BC. This date would have been recorded as the first instance in the Long Count records (the "Council Books"), but was actually the fifth instance since close calls were initiated in 806 BC. The date of 750 BC might qualify as an equivalent astronomical date for a Gregorian calendar date, except that I would expect a difference of four years, not three years. But it might do. The "Second Creation" date of 9-Kan 12-Xul first occurs on 5.16.19.7.4 (808 BC), and also repeats every 52 years. The third instance (6.2.4.15.4) happens in 704 BC, two years after 702 BC, the fourth appearance of Mars. It is very possible that the ceremonies involving the appearances of Mars were delayed by months or years, so that we simply have no way of knowing what the actual date was for the carving and burial of a stone head. This is not true of ceremonies involving the "Creation Altars" which were governed by the calendar rather than some cataclysmic event. Thus it is interesting that one of the dates for the "third creation" day names of 1-Ahau 13-Xul falls on 6.7.1.3.0, which is 609 BC, and only 498 days (1.3 years) different from the Long Count date found from the distance numbers. A difference of 1.3 years between the calendar date derived from the Long Count and the calendar date derived from the Calendar Round suggests that perhaps we are looking at records which were altered, that is, "corrected," by Monte Alban. It was in 607 BC, as I have pointed out above, that Monte Alban dropped the repeating Tzolkin calendar for a system where the Tzolkin would be restarted in the 365-day year after the first round, and then cut short after the 105th day. The Long Count was continued, but after the first year of the new calendar, the Tzolkin was displaced by 155 days, by 310 days after two years, and by 465 days after the third year. Ralph L. Roys, in an appendix to The Book Of Chilam Balam Of Chumayel lists a "Chronological Summary" of founding and abandonments of sites in the Yucatan, with respect to Katun 8-Ahau and Katun 6-Ahau, as follows. The Christian (AD) dates used by Roys represent the "Morley-Spinden" correlation, off by three years from the "Goodman-Martinez-Thompson" correlation. I have shown the "Goodman-Martinez-Thompson" dates to match the data of the table in the text, and added the Baktun and Katun. Notice that the primary city is destroyed during each instance of Katun 8-Ahau, but that the interval, as a result, is 256 years (as Edmonson noted), not the 520 years I have found for Olmec sites and locations in the Valley of Mexico. As mentioned by Malmstrom, Walter Krickeberg, in Mitos y leyendas de los Aztecas, Incas, Mayas, y Muiscas (1980), states that the Nahua (Aztecs) believed that the present "world" came into being in the equivalent of our year AD 726. Malmstrom calculates the Toltec Haab calendar as starting in AD 778 (52 years later). Krickeberg also dates the actual founding of the city of Tula to the year AD 856. The Toltecs apparently took up their earliest residence at a location south of Mexico City. In the writings of Fernando de Alba Ixtlilxochitl (AD 1568 - 1648) the claim is made for the founding of Tula to AD 566. Size of this page: 17641 words.